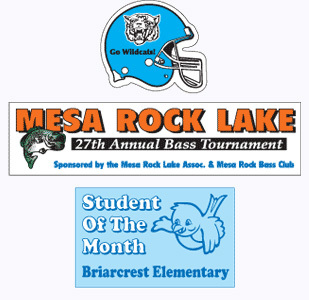 These durable outdoor magnets for schools and other groups are weather-resistant and thick enough for vehicle usage. Products are furnished in the shapes illustrated. School magnets are screen-printed on a .034" white flexible magnetic material. You can choose from any of our standard colors. All colors will be printed as spot colors. If 4-color process is required on Outdoor Magnets, call or e-mail for pricing. Shipping will be charged based on the actual shipping cost. An artwork fee of $20 is due before artwork begins. Pay by credit card today and let us get started on your school magnet! 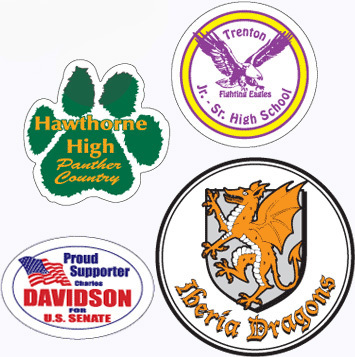 School magnets build loyalty and increase school spirit. Using the school mascot makes an impressive magnet. If you order at least 500 Bumper Stickers, a 5% discount on Magnetic Bumper Stickers will apply up to 2,500 pieces; same style and time. A great solution for temporary needs, yet durable and long lasting too! These are easier to remove. Offer these to friends who come up with an excuse for not wanting to put a bumper sticker on their car. Printed on .030" magnetic material, these car magnetic bumper stickers have a powerful custom magnet grip. Increase school participation with a school schedule magnet. Choose from among many different sizes. For parents who are proud of their students, let the rest of the world know. A bumper sticker magnet will let them know that we are proud of our children.